Production to be extended following successful European launch of new machine. Hollanders has reported an unprecedented number of orders for its new ColorBooster CB250Hollanders Printing Systems has reported that following the introduction of the ColorBooster 250 fully modular digital textile printer into Europe at FESPA Digital earlier this year, it has received a significant number of orders for the new machine. To keep up with demand, which has continued throughout the summer months, and which it maintains will increase towards the end of the year, the company has decided to extend its manufacturing capabilities. 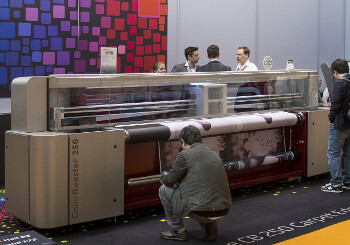 The ColorBooster CB250 is a 2.5m wide-format system that Hollanders say is designed to fit the market requirement for a robust, sensibly priced and versatile digital textile printer. Although its concept is new, the modular machine is based on the established technology developed by the Eindhoven-based manufacturer whose early models have long proved their durability by still being in daily use even though they are now more than ten years old. "Typical customers are those who know that they want to produce greener applications and work with light-weight materials, but want to invest at a realistic pricing level." Although Hollanders Printing Systems now has a full order book for the ColorBooster CB250, production capabilities are being extended to handle the increased demand for this new machine. Interest following FESPA Digital 2014 has continued throughout the summer break, with initial orders being placed from companies primarily based in Germany, Austria and Switzerland. The ColorBooster CB250 is the latest in a series of digital textile printing machines from Hollanders Printing Systems, and joins the ColorBooster XL 3.2m heavy-duty unit and the award-winning ColorBooster DS which prints simultaneously onto both sides of the material. Complementing these are the ColorWash and ColorFix systems that are designed to enhance the finishing process and enable users to increase their workflow efficiency.